Need more information about booking Home 7309486 ? Parkgate House is a 5 bedroom house, sleeping 12 people. It is a stunning rural property offering everything you would want from a relaxing holiday in the country for all the family. Parkgate House has something for everyone, whether in the house itself or in its surrounding locations of outstanding natural beauty. 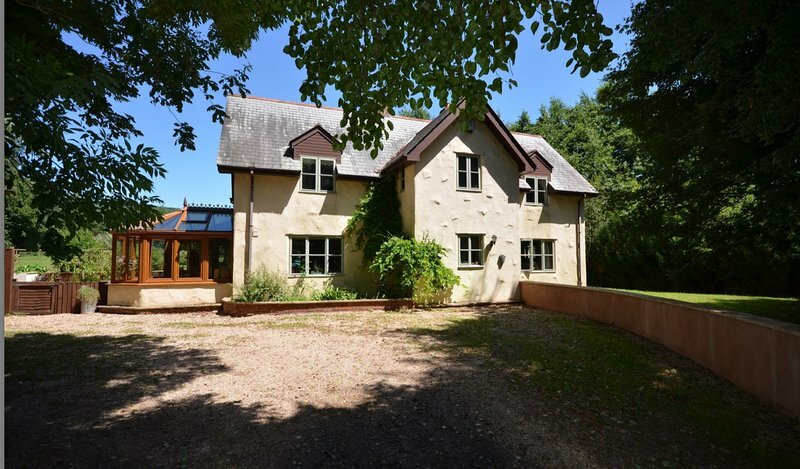 Parkgate House is a versatile and spacious country home with panoramic views of the Quantock Hills. The house is charmingly furnished with a wonderful farmhouse kitchen at its heart. Even the pets are well catered for with their very own room and large dog flap leading to an outdoor kennel. The gardens extend to just over one acre with an above ground swimming pool to cool down in on a hot summers day, and an al fresco entertaining area with a BBQ for tasty meals in the sun. This lovely holiday home is surrounded by beautiful countryside just waiting to be explored. Parkgate House is the perfect home away from home for a family getaway that you will want to revisit year after year. A car is needed at this property due to the rural location. We live one field across from the property so can be on hand to answer any questions you may have. Both of our mobile numbers are listed in the welcome book in the property should you need anything. Pets are allowed with prior permission. We only ask that they do not go on the furniture nor upstairs. We are more than happy for parties but we respectfully request that any parties outdoors are moved inside after 11pm and all outside lights are switched off. You can get in touch with Steph (the owner) through the contact form on this page. Send Steph (the owner) an email through the contact form on this page. Alternatively, if there’s a phone number on this page, you can call them. How do I contact Steph (the owner)? If you’ve already booked, go to Manage your holiday booking to view Steph the owner's contact details or send them a message. Or send Steph (the owner) an enquiry through the Contact the owner/manager form if you’d like a quote or more info first. When you pay online through the Book your stay form, a booking request is sent to Steph (the owner). You’ll find out within 24 hours whether they’ve accepted - no money will leave your account before then. You can also request a quote from Steph (the owner) through the contact form. The owner will email you the total cost for your dates and a link to book and pay online. Use the Book your stay form to pay provisionally online. You can pay by credit/debit card or PayPal. Steph (the owner) will have 24 hours to accept the booking and no money will leave your account before then. Why can't I call Steph (the owner) before booking? You’ll need to contact Steph (the owner) to do this. Send them a message in Manage your holiday booking or through the contact form on this page. You can request to change the dates or number of people on your booking via the Manage your holiday booking page. To change your holiday dates use the Edit booking button. If you need to change the number of guests staying then send Steph (the owner) a message. If Steph (the owner) agrees, they’ll send you a revised quote outlining the changes. You can review and accept/decline this from the Manage your holiday booking page. You’ll have 48 hours to take action before the revised quote expires.